Quitting time at the plant. Time for supper now. Time for families. Time for a cool drink on a porch. Time for the quiet rustle of leaf-laden trees that screen out the moon. And underneath it all, behind the eyes of the men, hanging invisible over the summer night, is a horror without words. For this is the stillness before storm. This is the eve of the end. A kind on cinematic supersaturation or hypercomposition results that floods the image and overflows the margins of the screen, resulting in a potential inundation of the viewer’s mind. This kind of moviemaking requires faith and commitment on the part of the moviegoer that there is some degree of intent on the director’s part to account for each drop of paint that he lets fall upon canvas. The true viewer-believer may even reach the point with a film by Antonioni where even the paint drops that seem serendipitous and unmotivated are not so and thus, strangely, causality and happenstance are either abolished or everywhere to be found. Once this unspoken alliance between director and viewer is forged, a willingness ensues to see everything in the film as potentially significant. In Catherine Russell’s comprehensive study of the films of Mikio Naruse, Russell once wrote (p. 289): “Like many directors of world cinema, Naruse’s films are often narratives in which nothing happens. . . . A familiar realist style, the narrative in which nothing happens has become established as a classic modality of art cinema.” Not surprisingly, I thought of Antonioni when I read this. The 89 films that Naruse made over a lifetime—stretching from the silent era into the 1960’s—are to a large degree conventional movies that were the product of the Japanese studio system. Because Naruse was a famously reticent man notorious for his silence, it was of interest to read that on his deathbed Naruse so openly expressed a wish to Hideko Takamine, the famous Japanese actress who starred in many of his films, that they make a film together in which she would appear for the entire film in front of a pure white background. Russell writes (p. 398) that “shortly before his death, in 1969, (Naruse) reminded (Takamine) of an idea he had hatched a few years earlier, of a film in which she would perform against a white curtain, with ‘no sets, no color . . . nothing but the drama itself unfolding before a white backdrop with no impediments.’ ” This radical proposal to make what would be an experimental film completely out of keeping with all of the films that Naruse had ever made, seems to be almost confessional, a secret wish that Naruse may have harbored sub-consciously—or not–for his entire life. Alternatively, the proposal may have been a kind of “undoing” in which one makes a funeral pyre of a lifetime of work and burns all that one has created (Something Buñuel wrote about in his autobiography). Brunette, writing of Rossellini—a director who progressively wished to strip away anything “non-essential” from his films, to “dedramatize” everything—states that “The greatest film will, paradoxically, do away with itself.” (Brunette, P. Roberto Rossellini. p. 54.) This desire to undo, erase, or vanish, resonates with so much of Antonioni’s own work. One is reminded of Flaubert’s desire to write a book “about nothing at all,” or as Joseph Bennett has written, “There is a purity [in Antonioni’s films] such as Mallarmé aimed at . . . working towards the blank page.” The reference to Mallarmé is explicitly made by Fellini towards the conclusion of 8½; Fellini had also written a short story for radio entitled, “L'amore è un foglio bianco” (“Love is a Blank Page”). The reference is also reminiscent of the Moravia novel, La noia, a book concerned with objects and reification, whose hero--a painter with a form of existential writer’s block--is incapable of violating the empty canvas before him. (Rauschenberg appeared to have a different point of view, famously remarking that “A canvas is never empty.”) The last frame of L’eclisse is entirely pitch-black in which the word “FINE” has dissolved leaving what may be construed as the residue of a monochrome painting lying on the white movie screen. The title of Antonioni’s film has been realized, an implied promise kept, some kind of an eclipse having come, not to life, but to death. The pure, uniform blackness is not achieved by the classical cinematic “fade to black” in which a gradual transition of the screen image to black occurs, something akin to a real astronomical eclipse in which a shadow passes rapidly across the surface of the Earth plunging a portion of the planet temporarily into darkness. Prédal in the conclusion of his book on Antonioni (p. 182) quotes Braque as saying: “Le tableau est fini quand il a effacé l’idée.” (“The painting is complete when it has effaced the idea.”) Apropos of the minimalist plots of both La notte and L'eclisse, Nowell-Smith has written that “Although compositionally sparse, they have great density.” Sitney, borrowing from an observation by Alberto Carocci, refers to L'eclisse as a “film totally based on concepts.” Angelo Restivo, writing of Rossellini and Roma, città aperta, seems to instead be writing of the coda of L'eclisse when Restivo writes, “The storyline would simply dissolve into a kind of documentary reportage of everyday life in a Roman palazzo. The film would then move toward that self-abolition that Bazin saw as the ultimate aim of the neorealist project . . . ‘No more actors, no more story, no more sets . . . no more cinema.’ ” In the case of L'eclisse, one may substitute the word “piazza” or “incrocio” (of the Eur) for “palazzo,” or instead, one may note that there is a palazzo that serves as the central locus of L'eclisse, but unlike the apartment of Rossellini’s Roma, Antonioni’s palazzo is a half-finished, empty, tract house in a gated community of the Void. When one considers how banal and threadbare is the plot of L'eclisse, it is remarkable how powerful and moving is the film. One can imagine the chronic difficulty Antonioni must have had in pitching his films to producers. Could he attract investors by describing the plot of L’eclisse? Poor Antonioni, a man of the utmost refinement and sensibility, a once-in-a-generation genius, stuck in a small cubicle, having 30 seconds to deliver the elevator pitch to cavemen: “Wait till you hear about this new idea I have for a film. This young woman breaks up with a guy, and then she meets a new guy, and they have a brief fling, and then break up!” What a grabber. Antonioni would not have those extra seconds to expound, for example, that in such a conventional tale of lost love, the characters are usually already married, and it is a spouse that is the obstacle. In L’eclisse, Vittoria and Piero are pointedly single, and it is existence that is the hindrance. In fact, such an exposition by Antonioni to the empty suits in the elevator would insure that the pitch would never get across the plate. Yet, Antonioni’s films--particularly L'eclisse--may seem entirely opaque if one is not tuned in to his thematic wavelength. * Antonioni is always rational, even when portraying the irrational. (Cowie has observed that in the opening sequence of L'eclisse, “ [A] panning shot passes over a cluster of intellectual books, among them Lukács’s Destruction of Reason.”) Unlike many of the abstract paintings that appear in Antonioni’s work, it is usually easy to connect his dots.39 For example, once one realizes that L'avventura is fundamentally concerned with serial eroticism and not merely with the decadence of high Italian society, the scaffolding of the entire film falls into place (one compulsive scene of seduction after another represent the highway marker signs of this “road” film). Other, so-called “difficult” filmmakers, such as Fellini, may also become comprehensible once their narrative devices or idiosyncrasies are discovered; to follow the progress of 8½ it helps to simply ask: “Is this scene a flashback, a fantasy or a dream?” With Antonioni--as compared to Fellini--a different compass is necessary to orient oneself. As Cavallaro has written of L'eclisse: it displays an “incoerenza coerente” (“a coherent incoherence”). In an analogous vein, Moravia writes, “Gli eventi--slegati solo in apparenza sono i taselli di un sapiente mosaico, il cui significato si svela soltanto a chi è in grado di intendere il linguaggio di Antonioni, ormai giunto ad una straordinaria rarefazione ed essenzialità.” (“The events, seemingly disjointed, are but the pieces of a larger, cunningly constructed mosaic, the grand design of which is apparent only to those who speak the extraordinarily refined language of Antonioni.”) Or Chiaretti’s observation of Antonioni’s discourse that it is “. . . apparentemente illogico e stravagante, eppure dotato di una sua spietata coerenza.” (“. . . seemingly illogical and fantastic, yet endowed with a rigorous coherence.”) [The quotations of these latter three critics are all cited in I film di Michelangelo Antonioni by Biarese and Tassone.] William Pechter--writing of L’avventura, but whose comments apply to L'eclisse as well--has even gone so far as to write that “The most salient quality of the film is its manifest simplicity. . . L’avventura has been called an abstract film, yet it abounds with concrete, realistic observation.” There is, indeed, the sense that L'eclisse entails a shift away from the connotative to the purely denotative nature of things, as if the film concerns a contemplation of the pure object itself and not its shadow cast upon some cave’s wall. Antonioni’s rationality is rigorous to the degree that it has been considered a defect by some critics (as opposed to other critics who view him as too “abstract”). As John Freccero has written, some film experts have regarded Antonioni as “too literary and pat.” Likewise, Joan Esposito has noted that “Dissatisfied Marxists saw [L'eclisse] as a formalist reverie.” Prédal in his book on Antonioni (p. 212) quotes Jean Douchet’s 1962 impression of L’avventura as “le comble de l’artifice, du truqué, ses tics et procédés étalés avec complaissance” (“The pinnacle of artifice, a complete con job, its tics and mannerisms shamelessly displayed”). Given the multiple, contradictory, and varying criticisms of Antonioni by so many critics, one may be left with the sense that Antonioni is damned if he does and damned if he doesn’t. That Antonioni may inspire such critical conflict may speak to the enormous richness of his art. If Antonioni’s films are short on story line, they are--like the water barrel soon to be empty--almost completely lacking in explicit declarations of meaning or directorial intent. (This Antonionian characteristic was noted as early as 1950 by the Italian critic, Di Giammatteo--quoted by Rohdie--when describing Antonioni’s first feature film, Cronaca di un amore.) The films lend themselves to exposition, but not in the conventional sense of finding explanations for the protagonist’s actions or the events that occur. As this book has tried to do, one can analyze in excruciating detail all of the cinematic embroidery of an Antonioni film, an act more akin to an anatomical evaluation of the film’s skeleton as opposed to the film’s subconscious. The films are extraordinarily “meaningful,” but the meaning must be supplied by the viewer. In a filmed interview of Antonioni for Italian television by the Italian critic Lino Miccichè (Antonioni visto da Antonioni ), Antonioni remarked to Miccichè (and I paraphrase): “I believe that the answers to all of your questions are [“lie”] in my films.” Antonioni’s genius resides in part in his ability to paint tableaux that both invite and reject interpretation simultaneously. Such an invitation to discover meaning coupled with a refusal to acknowledge significance cancel each other out, leaving the very Antonionian number, zero, as the film’s sum. The analysis of the interconnected motifs, which form the value context indicates an overwhelming complexity and profusion in the film’s use of physical objects to assign values. Thus the use of physical objects is one of the most potent aspects of this film’s style. Antonioni’s films are splattered, not unlike a Jackson Pollock painting, with “interpretable moments”—images, sounds, dialogue, or acts, which however mundane or quotidian—stand up on their hind legs and beg to be understood. Please tell me who I am and what I mean. Even in a dead quiet Eur on Sunday, or in Death Valley, or in a dusty plaza in a small city named Vera in Almería, Spain, where nothing of great interest seems to be happening, life and death are everywhere to be seen, hidden under every rock or staring at us straight in the face, daring us to take notice and make sense of them. We are tantalized by the notion that nothing ever happens but anything can (“Niemals geschieht etwas, aber alles kann.” Die Parallelstrasse. Director: Ferdinand Khitti. W. Germany ). All conventional movies contain “things.” What differentiates things in an Antonioni film from things in most ordinary movies is that Antonioni’s things possess self-awareness, analogous to the difference in consciousness between Homo sapiens and other animals. Animals are conscious but it is only Man/Woman who possesses a consciousness aware of itself. Almost all movies are replete with “physical objects.” Antonioni, however, participates in the creation of a world in which such objects cry out for attention, in which their latent meaning is opened up. Crudely put, if a two dimensional stick figure such as typically played by a Stallone or Schwarzenegger picks up a magnifying glass, the instrument generally does not serve any greater function than being used as an object to hit another character on the head with. When, however, Piero picks up a magnifying glass and twirls it for a second or two in his hand, the shades themselves quiver. Although Antonioni is generally regarded as a “visual” director as opposed to one who places emphasis primarily on dialogue, language becomes itself an “object of regard” demanding attention in all of Antonioni’s films. For example, Vittoria’s declaration early in L'eclisse that “There are days when a needle, a piece of cloth, a book, a man are all the same thing” becomes almost the Rosetta Stone by which the entire film may be read. Unlike many who write of Antonioni’s films, I find that narrative—the story that Antonioni is telling us—remains the primary focus, the book held in our hands, no matter how important the painterly aspects of visual composition were for Antonioni in all of his films. I will demonstrate that Eclipse is in a class of films whose meaning is created primarily by the formative devices within the work which form the value context. In Eclipse, for instance, numerous interconnected motifs constitute major patterns of value which the film seems to be placing upon the fact context. By building these motifs the film creates intra-referential meaning. By detailing these interconnected motifs, I will demonstrate that the meaning of the film might be created contextually or intra-referentially. My point of view is not new, it is related to phenomenology. I am thus obliged to linger ad infinitum on the details, on the repetition of the most futile gestures, in order that what I show may assume a form and a sense (Michel Mardore, “Antonioni, je suis un incurable optimiste,” Les Lettres françaises, No. 942, 6 September 1962. Translation by Ted Perry). Perry, in particular, discusses the recurring pattern in L'eclisse of “bars and barriers,” a pattern that he identifies as “the dominant visual motif of the film.” (Such patterns are analyzed by Mancini and Perrella in obsessive detail utilizing multi-colored graphs such as on p. 195 of their Architetture della visione.) Perry and I also differ in our degree of reluctance to say what such an omnipresent motif “means.” Perry states, for example, that such a motif “is intimately connected with the new independence and freedom which follows the loss of old values and absolutes.” I think that I understand this latter sentence. I also think that I understand that many critics have seen the bars and barriers as a manifestation of Antonioni’s insistence that we all separated one from the other, blocked as it were from my hand touching yours. I can only repeat that for philosophical or, perhaps, psychological reasons, I have a personal reluctance to take the large or small step required to go from identifying patterns to saying what they mean. For myself, the value of L'eclisse does not seem to depend on taking such a step. To some extent the foregoing discussion of the major patterns forming the value context is misleading, for it implies that the value context is a rather simple arrangement of themes and ideas, concepts and attitudes. Nothing could be less true. The patterns I have indicated and the values assigned to the fact context are an extremely complex interaction of cues, drawn from a rich texture of data in which the ideas are mainly implicit. The ideas and patterns of ideas I have indicated above are merely abstractions. Very often I cannot give an explanation because I see only images, and images are what I transfer to the screen. Very often these images have no explanation, no raison d’être beyond themselves.” (quoted by Rifkin, p. 16). An alternate approach to an Antonioni film would be to regard images as decorative rather than meaningful. In such a light, recurrent images such as bars and barriers assume aesthetic as opposed to thematic significance. In both painting and theater, for example, the placement of strong vertical elements may serve to “organize” the canvas or stage as opposed to signifying latent meaning. For some artists such as Matisse there appears to be an evolution from “meaningful” art committed to telling a story or making a point, to the pure decorative pleasure of pattern and design. Unitary interpretations of L'eclisse that depend on a single point of view are to my taste, unsatisfying. I find that monolithic political or psychological interpretations of the film are particularly clumsy. Early critics of Antonioni beginning with Cronaca di un amore in 1950 were incensed that Antonioni had somehow violated neorealistic etiquette, as though the “rules” of neorealism had replaced physics as the governing laws as to how matter behaves. Similarly, some Marxists were incensed in particular with regard to L'eclisse and its somehow “incorrect” understanding of love and money. L'eclisse becomes especially rewarding when one views the film as taking place on multiple levels that are not necessarily mutually exclusive. Take but for one small example, the act of Vittoria simply and briefly lifting up a black shawl while sitting with Anita early in the film. 1. Vittoria’s black shawl has erased a white night. There is a complex play of words occurring, one that relates in part to the theme of black and white, polar opposites, and eclipses. 3. The entire film is filled with bars and barriers not dissimilar from the black wall Vittoria has erected before herself. A black wall will again appear when Piero--standing in a small bar off of the Piazza di Pietra--unexpectedly spies Vittoria on the other side of a screen of black beads that separates him inside the small bar from Vittoria who stands outside in the Piazza di Pietra studying the doodle of daisies. 4. The film has an apocalyptic resonance which merits the wearing of a black shroud, homage to those already dead and those soon to die. 5. In the midst of so much death Vittoria plays peek-a-boo, hide-and-seek, now-you-see-me-now-you-don’t, catch-me-if-you-can, out-of-sight-out-of-mind, here-today-gone-tomorrow. 7. The present contains clues that allow us to anticipate the future. Within minutes after lifting the black shawl up over her existence Vittoria will--in an act of near magic--become an African woman. The shawl as blackface. Antonioni excels at creating images that embody multiple planes of meaning. The striking image of Vittoria and Piero standing in the middle of the screen with the Church of Sts. Peter and Paul in the background as the Alfa is hoisted out of the Eur lake has already been discussed. The literal and figurative “depth” or deep focus of such images is remarkable and runs counter to the flat surface of many films. In an Antonioni film a background detail may be as or more important than the ostensible object of regard presented prominently in the foreground. (In this particular book, the endnotes and footnotes are almost as long and perhaps more important than the body of the work.) As already discussed with regard to Vittoria’s manipulation of the empty picture frame in the opening scene of L'eclisse, distinctions between “background and foreground” lose their conventional meaning. Antonioni’s frequent use of mirrors, reflections in mirror and glass, watery surfaces, shadows, locales whose geography remains elusive, all contribute to the creation of an image whose richness is conditioned by its ambiguity. The multiple planes of meaning are both thematic as well as aesthetic. Take for example, the image of Vittoria in her childhood room wearing a dress composed of abstract curlicues as she stands next to an abstract painting of wandering, serpentine lines, hung on a wall whose wallpaper itself is an abstract design (see the Lane screenplay, fig. 46). Such an image is as well coordinated both aesthetically and thematically as is a fashionably dressed woman whose ensemble and accoutrement so tastefully match. Aspects of L'eclisse--and Antonioni’s films in general--are replete with moments that seem gratuitous, aleatory, unnecessary. At worse, such moments seem to be simple teases, a kind of dare to find meaning where there is none. At other times, these worthless moments seem invaluable in their tininess and glory, as if à la Montaigne or Blake, the microcosm recapitulated the macrocosm: see a world in a grain of sand and heaven in a wild flower Hold infinity in the palms of your hand and eternity in an hour (Again, whatever value this book possesses might be found in one dependent clause tucked away in a footnote contained at the bottom of an endnote never read by most readers). Take, for example, the scene at the small Verona airport. After landing, Vittoria strolls aimlessly off by herself and seems to be in some kind of vacant reverie. As is typical of Antonioni, the camera itself begins to wander listlessly off, capturing seemingly meaningless events such as planes taxiing on the field. One shot is that of a plane that is filmed coming in for a landing, the plane briefly touching ground and then, for no apparent reason, suddenly taking off again. The shot is so willfully capricious that one is tempted to ask if Antonioni “meant” anything by it, and if he did, does it “matter?” As one dwells on such images, meaning starts boiling up, as if significance itself could be spontaneously generated in a petri dish. Yes, one may say, life is “touch and go,” all of Antonioni’s characters are “in flight,” and so forth. I am reminded of a similar errant image in Blow-Up, that of the airplane propeller that the Photographer becomes so attached to, an image that Chatman “explains” rhetorically as a synecdoche, the propeller being but a part of a means of transportation that is meant to suggest the larger issue of flight--and evasion--itself. Or similarly in Zabriskie Point, the ship’s helm behind which Daria is seen in the house of Carefree, Arizona. Or in the English episode of I vinti, the large model of a ship in a London store window in front of which Aubrey and Wotten hold a conversation, the nameless boat of L’avventura not yet set sail for Lisca Bianca, in L’eclisse the model of a wooden ship in Piero’s room in the apartment of his parents. 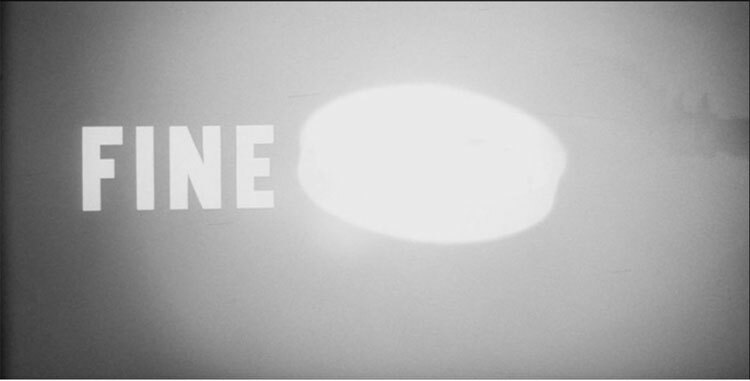 In an Antonioni film, an image that in a particular film initially appears elusive or idiosyncratic may accrue meaning over time as one views other Antonioni films. For almost all other directors, an initially cryptic image is explained later in the same film. That Antonioni may have made only one film is a consideration repeatedly invoked in this book. (One might even refer to all of Antonioni’s films as a loose collection of shared tropes.) When one speaks of Antonioni’s manipulation of montage, the term entails the selection of images occurring across time and the boundaries of all of his films, as opposed to a single movie. What has been referred to in semiotic theory as syntagmatic connotation--a kind of accretion of meaning as one image is compared across time with another--may apply in particular to Antonioni’s films (see Monaco for a general account of such semiotic concerns.) An old Italian man who has lived in Australia, who now lives alone on a volcanic island, who speaks a strange mixture of Italian and English, might seem a baffling character to interject in a film. However, as one encounters other such characters in other Antonioni films, or becomes aware of the babel of languages and language difficulties that perfuse the entire œuvre of Antonioni, what once seemed odd and singular becomes the way the world is. (Joe of Panarea is actually the reincarnation of another quite similar old man, the “randagio” or “stray dog” seen in the trattoria scene towards the conclusion of Le amiche.) It is not necessarily that we understand anything any better, but there is a kind of familiarity that is gained with repeated exposure to similar events and images created by Antonioni over 50 years of filmmaking. * (As Perry has written: “The recognition of similarities is not, of course, in and of itself a measure of quality, but it is a first step both in any description and in any understanding.” [Guide to References, p. 15].) When the David Hemmings character in Blow-Up is speaking English, but is not making any sense, or Locke struggles to speak with people whose language he does not know, the lack of understanding becomes comprehensible. There may even arrive a moment when--after coming to know Antonioni with time--we are able to feel more comfortable with the absolutely mysterious, a thought reminiscent of the “perfect clarity in ambiguity” that Mann writes of in The Magic Mountain (Mann quotation cited by Alex Ross, The New Yorker, 11 March 1996, p. 105). Niños! I’ve seen so many of them grow up. Other people look at the children and they all imagine a new world. But me, when I watch them I just see the same old tragedy begin all over again. They can’t get away from us. It’s so boring. Bah! Now, turn around and look backward. Do you see among the children playing in the Eur a girl and a boy named Vittoria and Piero? In the final scene of The Passenger, Locke lies in bed with the Girl in the Hotel de la Gloria and tells the story of a blind man who has regained his sight. (Is it not Locke who has been struck blind on the road—not to Damascus—but to Osuna?) Locke has lain down in bed, preparing to die in bed as Robertson had done not long after the film had begun. The nameless Girl emphasizes how dusty it is. The Passenger has come full circle, the film ending in a cheap hotel in a desert milieu just as it had begun. Dust to dust. Did both men also die of a wound to the heart? After finishing the quite moving story, Locke and the Girl gently embrace lying side by side in bed. The camera then pans upward to a small undistinguished landscape painting hanging above the death bed, the type of paint-by-number art not uncommonly found in cheap hotel rooms. When I first saw The Passenger in its general release in a cinema in 1975 I remember thinking, “Why is Antonioni so deliberately showing us this mediocre painting?” Some 25 years later on viewing the film for perhaps the fourth time and after studying Antonioni’s other films repeatedly, sufficient accretion of meaning over time had occurred. The most prominent subject of the landscape, grounded in the foreground of the painting, is that of two trees joined at their base, standing side by side, next to--in Antonioni’s world--a ubiquitous body of water. Less conspicuously seen in the background is a building--perhaps a monastery--that chimes with the Munich church where the guerrilla leader, Achebe, had asked Locke to convey his regards to Daisy, or to God. Cheap art, like cheap music, may or may not contain great verities. A modest goal of criticism is empirical in nature and entails a kind of tidying up of the clutter of the work of art, identifying its bits and pieces--its things--and placing them in their proper drawers. One might feel a sense of satisfaction in analyzing the riddle of the Drunkard, only to conclude--like the Drunkard himself--with a world weary shrug of the shoulders, “So what?” (A 1970 essay by J. Simon et al in Film Heritage that is cited by Rohdie bears the title, “Antonioni: What’s the Point?”) Or as Vittoria herself repeats at both the beginning and end of L'eclisse, “Non lo so” / “I don’t know” (reminiscent of Anna’s urgent, machine gun exclamation of “perché? !” / “why? !” eight times in a row in Sandro’s apartment in Rome at the beginning of L’avventura as well as Rosetta’s similar repetition of “perché, “perché,“perché!” while on the train with Clelia returning to Torino from their beach excursion in Le amiche). Criticism, as such, may ultimately be limited to merely redescribing what has already been described, a kind of pseudo-understanding. Why Antonioni chooses the themes he does, and what it all adds up to are entirely different questions. (Brunette has suggested that with Antonioni’s films it may be best to “examine more closely the errancies of textual particulars and to pay less attention, at least for a while, to the ‘big picture.’ ”) The answer to these questions lies more, perhaps, in an autonomous domain of criticism, and may, indeed, have nothing to do with the work of art itself. It is, of course, characteristic of Antonioni that no explicit answers are offered.42 Or, as Brunette again writes, “Antonioni’s films continually offer the promise of meaning, like the gaping garment of French theorist Roland Barthes, tantalizing the viewer and yet always withholding any unambiguous signification.” Indeed, a particular irony regarding criticism of Antonioni including this book is that such analysis often seeks out answers and explanations that Antonioni himself so carefully avoids. The very conclusion of L'eclisse represents, a deliberate refusal to engage in conventional exposition. We are, instead, invited to regard the strangeness of the familiar, the mystery of the ordinary. A broken piece of wood, a matchbook, a woman, a man. Antonioni did not achieve the idealized goal of Flaubert or Mallarmé. Ultimately, Antonioni made about 15 motion pictures over a period of approximately 65 years and committed himself to putting images and words and sounds to celluloid. As such he could not wriggle out of presenting a viewpoint, a Weltanschauung. No artist, if they lift a brush, pick up a pen, turn on a camera can do so. No matter how detached Antonioni may seem from these pictures, how enigmatic and elusive the meaning of the pictures may seem, Antonioni—like the creatures of his imagination—was never able to escape. As was with the case with the English owner of the antique store in Blow-Up who wished to flee to Nepal or the tragic, Italian sugar refinery worker from Goriano in Il grido, Aldo, who suffered from a sad, fleeting desire to carve out a new life in Venezuela, finally just casting his little paper scraps of South American maps and travel brochures to the four winds—Antonioni may also have wished to escape. However, a geographical quest or the making of glorious films would never be the cure for an inner sorrow. (Antonioni did both: he became an “international” film director, traveling endlessly around the entire globe and continuing to struggle to make films in the winter of his days.) Despite Antonioni’s horror of adhering to a reductive, programmatic ideology, in the end he painted a picture, one that is to a large degree, decipherable. And the picture that he has painted is not a pretty one. The world he has consistently shown us is a place where a lasting, healthy love is not possible, the senses are not trustworthy, death and loss are everywhere, love is not as strong as death. Whether Antonioni intended to or not—and I doubt it—his major films are fundamentally “cautionary tales,” no matter how visually elegant the presentation of the surface of their world. The wages that Antonioni pays his characters for their sins are estrangement, pain, and death. It is a constrained vision, narrow as compared to that of Kurosawa or Kubrick, lacking in the possibility of redemption that Rossellini or Fellini in a gesture of hope in a hopeless world could sometimes offer us. At worst, Antonioni’s vision may be merely inaccurate. I fear that as I approach concluding this book that I may have outgrown and abandoned the hero of the tale. Or perhaps I, too, in my smallest of ways, have coveted the ideal of Flaubert and Mallarmé and erased what I have written in the act of writing. I, like my hero, may have in the end, been left with nothing at all. It has been over 45 years since the film crew last stood vigil at the intersection of Viale della Tecnica and Viale del Ciclismo, where the water barrel once sat, waiting in vain for Vittoria and Piero. (Were Vitti and Delon on set for the shooting of the coda, watching themselves, Vittoria and Piero, being filmed standing each other up? As if an autoscopic hallucination . . . the void gazing upon itself). The average Roman passerby has neither seen nor even heard of L'eclisse, and is unaware that a film was shot there by a now quite elderly, infirm man from Ferrara who attempted in some fundamental way to view, to reimage a world. One can easily imagine the majority of young Roman lovers of present day—soon to be old, when old age shall this generation lay to waste—walking hand-in-hand past this now anonymous intersection, people who have never seen L'eclisse, couples who are oblivious to what once didn’t happen at this site once upon a time. Once, while walking on a nondescript, late summer, Roman afternoon past the intersection of Viale della Tecnica and Viale del Ciclismo I had a brief chat with a Roman woman in her 20’s, intelligent, well-spoken, urbane. She was walking a dog similar to my own and, as is the case with dog-lovers, we swapped a canine story or two. Against my better judgement I asked her how long she had lived in the Eur, to which she replied, “All of my life.” Against my better judgement I then asked her if she had ever seen L’eclisse, to which she replied, “Mai sentito” (“Never heard of it”). Strangely, I felt relieved, even happy that she and the movie had missed a date, a collision with one other, grateful that she, unlike me, hadn’t bitten of the apple. We talked a bit more about dogs and Berlusconi. When I asked against my better judgement what was her name, my heart sank for I suddenly realized that beyond the shadow of a doubt she would reply, “Vittoria.” “Sabina,” she smiled. A nice Roman name for a nice Roman woman I thought. As Vittoria had noted to Piero in their final moments in Piero’s office, it was late, no time left, no time at all. I glanced across the street at Via del Ciclismo 19, scant meters from where the water barrel had once stood, smiled pleasantly, told Sabina that it had been a pleasure chatting with her, and then it was “arrivederci,” until we see each other again, an incantation of sorts against all final goodbyes. I have not yet seen Sabina again, but as the Italian adage goes, one that in Il grido, Elvia, an old love of Aldo who had not seen him for many years, observes to Aldo: “Chi non muore si rivede.” (“Those who do not die see each other again.”) I thought of Vittoria and Piero, their inability to say “arrivederci” to one another, and the general issue of the veridicality of proverbs. Approximately a decade ago there was a small, undistinguished, wooden plaque at the tennis courts of Maryon Park commemorating the shooting of Blow-Up at the site. At the time I had thought to myself that in the indeterminate future when our planet is perhaps explored by beings from another planet, that these highly advanced space travelers will undoubtedly rummage among the contaminated radioactive debris of our planet—debris with a radioactive half-life on the scale of geologic time—and come across a copy of Blow-Up. In my fantasy I imagined that these travelers would possess the most advanced skills of archeology and paleontology and that they would be able with painstaking effort to piece together and play the radioactive, glowing disc. They would marvel at this strange artifact of a lost civilization and conclude that on the basis of Blow-Up alone, this now dead world, consumed in an atomic holocaust of its own mad making, had once achieved an extraordinary sophistication. My fantasy was such that I even imagined that after a survey of all of the cinder and ash, the bone fragments, the dead scrolls, that the extraterrestrials would conclude, in fact, that Blow-Up appeared to represent the apogee of development of this now lost world. My fantasy dictated that they would, of course, also greatly admire L'eclisse, a truly foreign film, which would be an intergalactic box office smash megahit that would break all attendance records when brought back and shown on the space travelers’ native planet. My imagination seemed to have no limit as I envisioned the alien viewers of L’eclisse weeping alien tears at the tear-jerking conclusion to the film. Where are Vittoria and Piero? Perhaps, I imagined, the aliens might weep, not realizing that the movie was a fiction and hadn’t really occurred. Or more painfully yet, were the space beings weeping out of joy—or out of sorrow—for a race of people, ostensibly primitive Earthlings, who were compelled by some strange impulse to create art, to make out of nothing and for no apparent purpose, such a thing as L’eclisse? The plaque in Maryon Park, only ten years ago, was badly vandalized and scarred by graffiti that did not appear to contain any profound anagram, hidden or cryptic message. I took a photograph of the plaque in 1999 which now in 2014 I seem to have misplaced, or perhaps the photo has been stolen or unwittingly-fittingly fallen in the interstitial space between two appliances in my home, or stranger yet, subject to spontaneous combustion. I do remember, however, carefully taking in 1999 the additional step beyond that of snapping a photo of the plaque but of also looking at the plaque in Maryon Park with my eyes and with my mind and carefully gripping it in my unfaithful memory, memories which slip through my fingers daily now to ground (memories, once lost, I cannot remember to remember). It is not even a matter of memory at this point—not yet, at least—but one of knowledge: I do not know if the plaque still exists. (An article by Robert Nurden, “On the Trail of the Swinging Sixties” in The Independent, 21 September 2011, notes that “the simple plaque commemorating the filming [of Blow-Up] in the summer of 1966 has been wrenched away.” [ http://www.independent.co.uk/travel/uk/on-the-trail-of-the-swinging-sixties-415444.html ]. As of 9 December 2015 there are apparently images widely available on-line of new plaques—some already disfigured—which have recently sprouted up as if perishable truffles in Maryon Park). To my knowledge, there is no plaque in the continental Italian peninsula commemorating the shooting location of any of Antonioni’s films. *shooting location of any of Antonioni’s films. 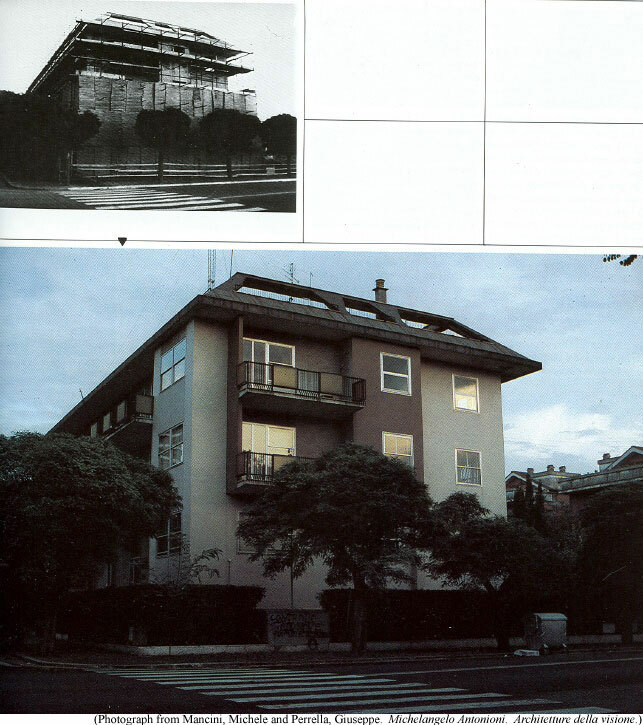 On the 26th of April, 2007, a reception was held in the Salone delle Bandiere of the Palazzo Zanca in Messina for the publication of a book edited by Nino Genovese entitled Omaggio a Michelangelo Antonioni. Messina nella sua Avventura. The following day, a restored print of L’avventura was shown at the cinema Odeon in Messina, followed on the 28th of April by the commemoration and placing of a plaque at the intersection of viale Europa and viale San Martino near the site of the Bar Grotta Orione, directly inside and outside of which Antonioni had shot the crowd scene of Messina in December of 1959. The bar no longer exists. When I was last in Messina in 2007, none of the local and quite erudite Messinesi with whom I talked were aware of the placement of the plaque nor even the link between Antonioni and their city. The scene shot by Antonioni in the municipality of Messina, although complicated—as is generally the case with crowd scenes—was, however, relatively brief in duration. I thought it curious that neither Noto nor Taormina (provincia di Messina), Sicilian cities where more lengthy and climactic moments of L’avventura were shot, had not yet elected to commemorate in any manner their role in Antonioni’s film. I grew cynical and wondered whether some politician or bureaucrat in the Ministry of Cultural Affairs or the Office of the Mayor had come across a marketing gimmick, sheer hucksterism, for the self-promotion of the city and province of Messina. If so, it appeared to me that such a hypothetical, homegrown civic boosterism campaign to pitch Messina’s role in L'avventura had failed even within the confines of Messina itself. Although Messina’s connection with Antonioni may not have struck paydirt, the province—like a true Sicilian scythe—has reaped a greater yield from its connection with another director by the name of Francis Ford Coppola; numerous Sicilian tour agencies are perennially attempting to harvest tourists who wish to visit “Godfather Country” in the province of Messina where scenes from The Godfather: Part II were shot in anonymous villages such as Savoca and Forza d’Agrò, little spots unknown to even many Sicilians. And on an even grander stage yet—standing opposed to the lonely, little plaque at the undistinguished intersection of viale Europa and viale San Martino in Messina commemorating L’avventura—organized tours were already fanning out over Europe as admirers of The Da Vinci Code were descending on shooting sites in the Caput Mundi of Rome, London, and Paris, like locust. There has never been a plaque, let alone a shrine, for the film, L'eclisse, at the corner of Viale della Tecnica and Viale del Ciclismo in Rome. And yet, this little asterisk on the grand map of Rome is the crossroads of lost lovers, the intersection of the forgotten, the oblivion that lurks behind the mask of everyday life, a horror without words. In my fantasy of 2008—as opposed to the fantasy of 1998 in Maryon Park—I assume that the space travelers will regard the Eur intersection as sacred earth as compared to the relatively trivial importance of the Bocca della Verità, Trajan’s Column, or, for that matter, the entire Roman Forum. When I first wondered what vain token of remembrance could possibly commemorate the intersection of Viale della Tecnica and Viale del Ciclismo, the image of the cenotaph at the hypocentre, ground zero, in Nagasaki (500 meters above which the bomb detonated at 11.02 on 9 August 1945) again flashed through my mind, a black monolith arising in the middle of the bull’s-eye of the concentric circles in the dust outside the Hotel de la Gloria in Vera. Although it may be said that Vittoria and Piero no longer exist, their existence was from its conception, fictive. As of this writing, Alain Delon is alive, but describes himself in a recent interview as ill with a heart condition, isolated, lonely, depressed, and suicidal. (http://www.repubblica.it/2005/i/sezioni/spettacoli_e_cultura/delon/delon/delon.html. [retrieved 8 February 2008]). Delon lives alone with his beloved dogs, separated from his young wife and young children. It was not long ago that a dog he greatly loved, Poeky, died. In 1961 Delon played the part of Piero, a hustler—a grade or two above Accatone—who worked his trade at making women and money at the Piazza di Pietra. In 1952 De Sica filmed Umberto Domenico Ferrari as he stood with his little dog, Flike, hat in mouth in the Piazza della Minerva, a stone’s throw away from the Piazza di Pietra, begging for the approximately 3 dollars that meant the difference in Italy after the Second World War between whether a man lived, or whether he died. Alain Delon—a man of once princely beauty, the world in his hand, someone who could charm the birds out of trees—has like so many of Antonioni’s fictional characters metamorphosed into someone else, in Delon’s particular case, a version of Umberto D. Monica Vitti suffers from a chronic illness, and has not made a film for over a decade or a public appearance for approximately 3 or more years. It has proven surprising to some in Italy that la Vitti had not attended the funeral of her close friends and colleagues, Alberto Sordi and Nino Manfredi, a testament to the potential seriousness of her illness, rumored by some to be Alzheimer’s disease; we may stand up a lover at 8 o’clock in our youth, but we shall not tarry, no, nary an instant for the funeral celebrating our own demise. Michelangelo Antonioni has suffered a stroke and is paralyzed on the right side of his body, no longer able to speak. (At both the beginning and end of L'eclisse the human voice is banished.) Lane has informed us that Antonioni had filmed a scene with Monica Vitti at the Museum of Natural History in Verona in which Vittoria examines ancient fossils and becomes aware of the span of geological time, an unimaginable duration of which 45 years is but a heartbeat. Mayflies, efemera in Italian, our brief moment in the sun seeking to mate and then die in one short summer of a very long eternity. The very stone one kicks with one’s boot will outlast Shakespeare. 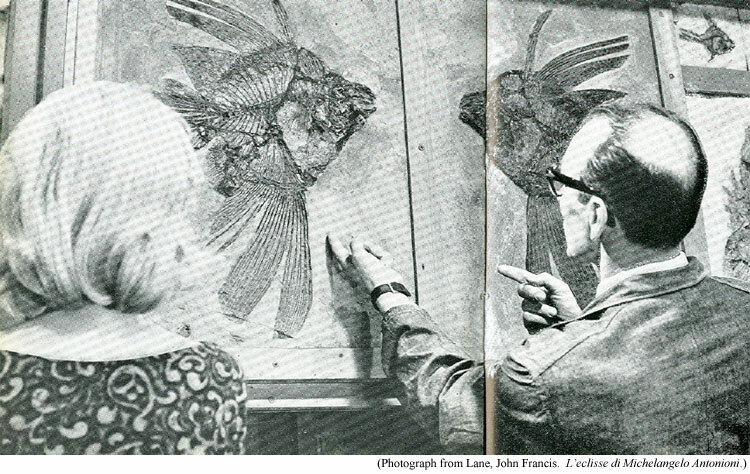 Lane’s description of the scene is accompanied in his book by a movie still—a kind of fossil in itself—of Vittoria standing before 80 million year old fossils hung on the wall of the museum. I do not know whether this snippet of film—abandoned by the producers from the final film and left to lie lonely on the cutting room floor—still exists. marked by lovers and styles of clothes.